The Round of 16 had two more games today, and although they weren't quite as exciting as the ones we saw yesterday, let us recap all the action for you. With 87 minutes played and Mexico 1-0 up, while eying a spot in the Quarter Finals for only the third time in their history, the Netherlands looked dead and buried. The Dutch were able to pull themselves out of the fire though and progress to the Quarter Finals at the expense of a very unlucky Mexican side. A tough first half, with the stifling conditions seeming to hamper both sides, was edged by the Mexicans as they cut out the supply line to Robin van Persie and always looked to hit the Dutch on the break. Early in the second half a breakthrough arrived thanks to a 25 yard belter from Giovani dos Santos. Fighting off two defenders, the former Barcelona man rifled a low shot into the corner to give his side the lead. For the remainder of the half, the Netherlands pressed and pressed, yet couldn't get one past the peerless Guillermo Ochoa. As he had against Brazil in a memorable group stage encounter, he stopped everything the Dutch sent his way. With only minutes of regulation remaining, a deep corner from Arjen Robben was cleverly knocked back by Klaas-Jan Huntelaar to Wesley Sneijder, who rifled in an equalizer. Smelling blood, the Netherlands went for the kill as the Mexicans looked visibly shattered. 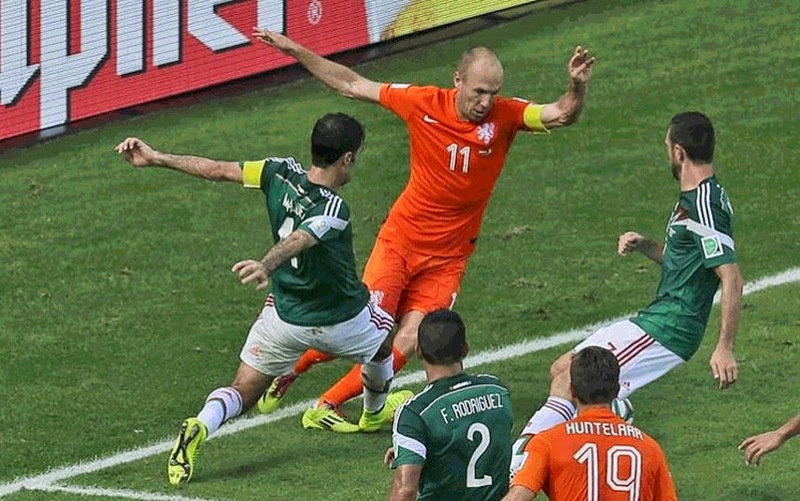 Deep into injury time the slightest of touches by Rafa Marquez on Arjen Robben saw the Dutch speedster hit the turf and the referee pointed to the spot. It was a very questionable decision and one that leaves the Mexicans feeling understandably aggrieved. Klaas-Jan Huntelaar tucked away the penalty with minimal trouble and with that the Dutch were through. It was a tough end to the tournament for a Mexican side that came so close to a Quarter Final berth. The first half of the today's second match, between Greece and Costa Rica may go down as one of the most tedious in this otherwise wonderful tournament. Greece, a notoriously defensive side, didn't just park the bus in the first half, but rather set up a fleet of Greyhound coaches in their half. Costa Rica weren't able to break it down and it contributed to an absolutely dreadful first half. I actually fell asleep through part of it and had to make a strong coffee at half time so I could write this report for you. The second half brought a little more in terms of attacking play and finally Bryan Ruiz broke the deadlock for Costa Rica in the 52nd minute. The ball seemed to move in slow motion as it rolled into the corner of the net by virtue of Ruiz's well placed shot. In the 66th minute Oscar Duarte lunged into an awful tackle on Greece's Jose Chovelas and was shown his second yellow card. As Duarte slowly trudged off the pitch the Ticos reorganized themselves and attempted to keep the Greeks out for the final 24 minutes. With Keylor Navas excelling in the Costa Rican goal it looked like they had done enough to get through, only for Sokratis Papastathopoulos to equalize deep into injury time. In extra time, the Greeks went on the offensive and tried desperately to put the match away. Navas made some heroic stops on the European side and did just enough to get his side to penalties. In the shoot out, both sides scored their first three, but on Greece's fourth attempt Nava's made a spectacular save on Theofanis Gekas to put his side on the brink. Cool as a cucumber, Michael Umana then fired his side to the first World Cup Quarter Final in their history. For a country that was not expected to make it out of the group stages, this is a wonderful achievement and will go down as probably the greatest moment in their football history.